Explore all of Anthony's T-Shirt designs on Amazon. 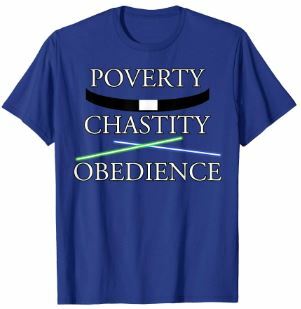 Share the connection between Catholic religious who take vows of poverty, chastity, and obedience and the Jedi of Star Wars who live similar commitments. Share your faith in a fun and easy way with this shirt available in various colors. More details on Amazon. 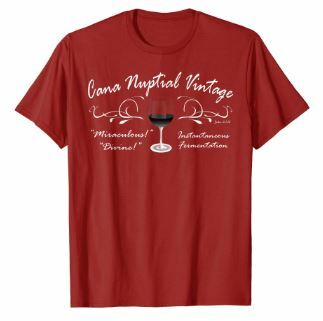 Celebrate Jesus' first miracle at the Wedding Feast of Cana with this funny T-Shirt. Image says "Cana Nuptial Vintage," "Miraculous," "Divine," "Instantaneous Fermentation." Available in various colors. More details on Amazon. 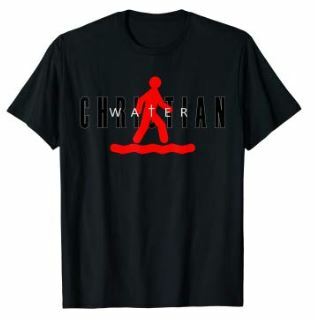 Improve your game with "Water Christian" T-Shirt satire of "Air Jordan." For elite disciples and effective evangelization! Start a conversation with this Christian satire athletic footwear brand, and remember, Peter walked on water too. Makes a great Christian gift! Available in various colors. More details on Amazon. St. Patrick T Shirt celebrating the life work of this British boy who was kidnapped by the Irish, enslaved for years, escaped and become priest and bishop, then to return to Ireland where he was held captive as a boy, now as a missionary! A great way to recognize this patron Saint on St. Patrick's Day, for Irish fests, or any time of the year! Makes a great gift. Available in various colors. More details on Amazon. St. Patrick was a Catholic Saint who was captured by the Irish, enslaved, escaped, became a bishop, and returned to Ireland as a missionary. 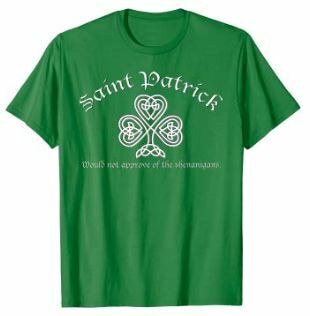 Bring back an authentic Saint Patrick spirit on St. Patrick's day, Irishfest, or any other time of year with this shirt declaring: "Saint Patrick would not approve of the shenanigans." More details on Amazon.